So easy to Make Your Own Sidewalk Paint with just a few ingredients you probably already have in the kitchen and so much fun to paint with. A good alternative to sidewalk chalk! We have been having lots of rainy afternoons around here so here are 8 Colorful Children's Books to brighten up a gray afternoon. Another fun idea for a rainy afternoon (and a great way to get out a little energy inside) Color Relay game is fun to play and you can play it with anything. 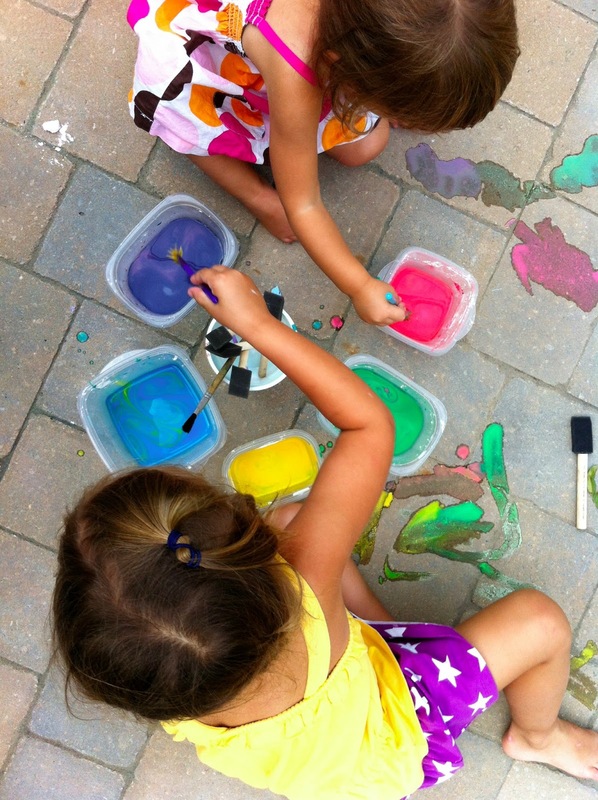 We did this a few years ago when the girls where still just learning their colors so I am excited to try the Cornstarch Color Mixing Experiment again. Bubbles are a summer staple around our house and Bubble Paintings is a good way to spice it up. I have done this project with older kids who loved it as much as the girls. I also recently saw an idea for using the bubble paintings as wrapping paper. I always love the idea of painting outside but the thought of taking all the stuff somewhere seems very daunting. Watercolor To-Go Papers are easy to make, you can make them ahead of time and then take them to any park, vacation or even just the backyard. They are great for older kids who want to work on painting landscapes from observation.